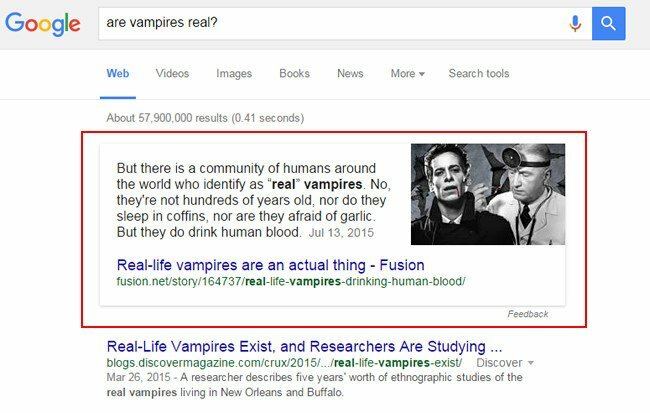 Featured snippets were first introduced as Quick Answers by Google in 2014 as a part of its Knowledge Graph. The option was then rebranded to Featured Snippets a couple of years back but serves the same purpose. The snippet provides answers to simple questions on the Search Engine Results Page (SERP), so users don’t need to visit a website unless they desire more information than whats provided for their query. Featured snippets provide quick and succinct answers to search engine users. If you want to be seen in this section, you need to provide good answers to questions relevant to your industry. There’s only one position open in Google’s answer box, so it’s a good idea to choose the right questions. You can find what the common questions are by looking at Google’s suggestions and typing relevant keywords in the search engine bar. It’s also a good idea to explore Q&A websites like Quora and Yahoo! Answers, to find questions relevant to your industry. SERPs triggered by generic keywords usually don’t include answer boxes, and sometimes the information is sourced directly from Google’s knowledge base instead of third-party websites. Targeting these keywords won’t give you the desired results, which is why you need to target long-tail keywords, phrases, the “how to” questions. An answer to industry-related questions and queries has the highest chance of being featured in a snippet. Unless you’re targeting a very specific query or are a niche business, you will encounter a lot of competition for a feature in the answer box. That doesn’t mean you can’t replace competitor content. After you create a list of questions you would like to answer, read all of the current snippets to the questions carefully. Check the rankings of the website link, study the content to determine if it’s well-written, accurate, and current, and make a note of weaknesses. It’s a good idea to target snippets provided by lower ranking websites, as you’re more likely to replace them. For content to be featured in the answer boxes, they need to follow a specific structure. Break the content down to the smallest parts and include bullet points, short paragraphs and sentences, and visual content like graphs and tables. You also need to make sure all answers are well-written, provide current information, and are well-researched. The average snippet size ranges from 40 to 50 words so you should structure your headings, subheadings, and content accordingly. Featured snippets can increase the sessions by over 500% and increase CTR from 2% to 8%, which can lead to a big boost in revenue. While making sure your content is ready for Featured Snippets requires some time, money, and research, the results are worth the effort.